For the rail aficionados amongst us, perhaps the Hexpass Express will be of interest. This little train comprises two coaches and is drawn by a vintage Fordson 35 horse power tractor; travelling at a maximum speed of 20 kilometres per hour. The railroad was originally abandoned but the coaches now climb the steep levels of the Hex River Pass between the stations of Hexpas and Matroosberg. Dating back to the 1870’s, the route runs through one of the most beautiful areas in the Western Cape. The Hexpass Express offers three different trips. The first is a trip from Hexpas Station to Tunnel Station and back again. This journey takes approximately four hours with time included to relax and have a picnic at Tunnel Station (bring your own picnic). A slightly longer excursion is the 5 and a half hour trip which departs Hexpas Station for the Kaffrarian Rifles Monument and back again. 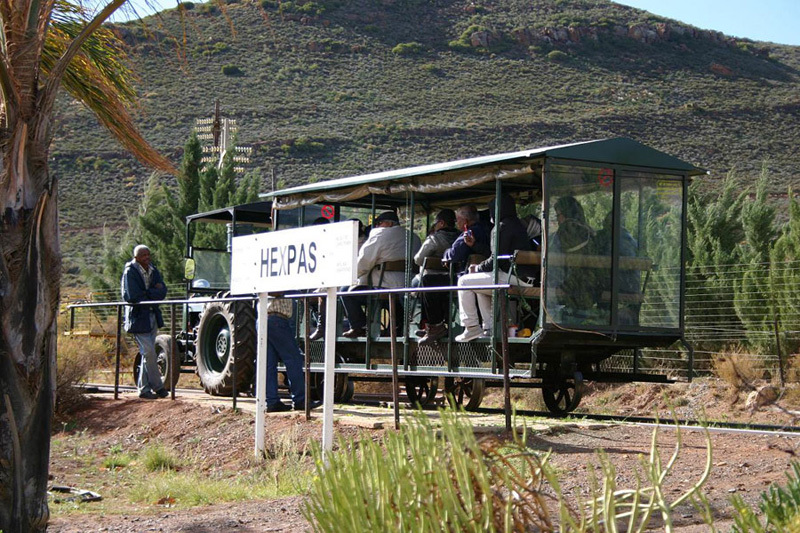 The third and final trip is from Hexpas Station to the summit at the Matroosberg Station. This station is a beautifully restored Karoo station – well worth spending a bit of time at. On all three journeys passengers are shown the 130 year old railway tunnel. There is a guide present on all three trips which comes in handy for identifying the many indigenous plants and wildlife which one can spot from the train. An interesting portion of the journey is the remains of the British stone fort – look out for the 100 year old inscriptions on the walls. The Hexpas offers a wonderful day out, whichever of the three trips you decide upon. The different seasons through the year each have their advantages; winter scenery includes snow-capped mountains (wrap up warmly), autumn gives a gorgeous vista as the leaves of the Hex River Valley vineyards prepare to change colour while spring and summer offer hot, sunny days. For more information contact Worcester Tourism on 023 348 2795.